He seems to be assuming that the show was set a thousand years in the future of when it was later established to occur. Kirk is now considered to have been born in 2233, and the five-year mission took place in the late 2260s. Since the Julian Period lasts 7980 years and the current one began in 4713 BCE, the next Julian Period begins on January 1 of the year 3268. Thus, a Julian Date of 1312.4 would be 1,312 days, or about three-and-a-half years, later, on August 5, 3271, as he says. Presumably "Julian B" refers to the next Julian Period, so the current one is Julian A. It has long been a mystery what exactly C-1277.1 means on Kirk's tombstone. Obviously, Kirk is more than 36 days old; more like 36 years. Some have suggested that C stands for "captain", and that these are the dates of his command. But perhaps it's for Julian C, indicating that the first stardate is in a different period than the second, although it's hard to infer the specifics. The year 3235 lies between Julian days 2,902,620 and 2,902,984. But it appears that somebody else picked the stardates, and de Forest was trying to retcon them as Julian Dates. So we now have a genealogy going back to the French Revolution, starting with the Republican Calendar and decimal time, which passed into astronomy through Laplace, being combined with Herschel's Julian days, eventually to inspire the creation of stardates. I have more apps for iPhone and iPad. Since I've been posting about the French Republican Calendar, I'll post about those first. I've talked earlier about Calendrier, Salut et Fraternité for iPhone, Salut et Fraternité for iPad and revol-di. Now we have some more. CalRep by Jacques Lafon (MuppetJack) is a universal app (meaning it is designed for both iPhone and iPad). Originally released October 2, 2012 (56202, CCXXI/1/11), version 2.1 November 5, 2012 (56236, CCXXI/2/15). It is free, with $1.99 in-app purchase for the "complete version". I don't know what that means, and I'm not going to pay before I find out. In addition to the current date, you can convert between Gregorian and Republican dates for any year after I. I found one bug: all the Roman numerals for years are wrong on the selector, e.g. the current year 221 shows CCXX, although on the iPhone (but not iPad) the year is also correctly shown next to the picture. It starts in 1792 as "Yr (1) / Yr I (2) / Yr II (3)…" It sends daily alerts, which I like, and you can set what time to receive them, although for some reason you can't get them before 9 am, which is late for me. The dates are calculated according to what I call the continuous rule, which is the fixed rule that leap days are added before (not after) most years divisible by 4, which is continuous with leap days during the Revolution, although those were determined by the equinox rather than a fixed rule, so sometimes it's a day off from the equinox date in some years. It does not show the decimal time, but it does show for each date the month's calendar girl and a picture of the rural calendar name, although for today it shows the barbel fish instead of the cornflower (barbeaux)! (See previous post.) It also has links to Wikipedia articles, although some of them don't exist, as such. Unlike some of the others, it does not show decimal time. 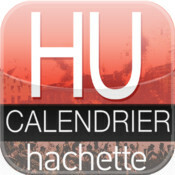 Calendrier républicain by Hachette Livre is also a free universal app, released on September 3, 2012 (56173, CCXX/12/17). It converts between Gregorian and Republican dates, and also converts French day names (like Barbeaux) to dates, although you have to scroll through an unsorted list of 366 names! However, like revol-di, it only works for dates during the Revolution, itself. But you can use it to find current dates if you add 220 to the year. It also does not show decimal time. TI:ME by Alexander Clauss is a 99¢ universal app, released November 2, 2012 (56233). It displays the current time in any of the following formats: decimal, local standard (24-hour, 12-hour or AM/PM), standard in other timezones, Braille, hex, octal, Swatch Internet Time (.beat), NATO DTG, trig (degrees or radians), or with numbers represented by symbols on the periodic table of elements. There are various settings for each clock. Geek Time Pro by reizverstaerker medienwerkstatt OG is a 99¢ iPhone app, released August 9, 2011 (55782). It displays the time in binary coded sexagesimal (lights or 1/0), binary coded decimal (BCD), hex time or decimal time. Duodi 22 Prairial an CCXXI à 2 heures 42 minutes décimales t.m.P. Meadow refers to the Republican month Prairial, which comes from the French word prairie, which means the same as in English, but it can be translated as "meadow", although then the month name should then be Meadowal... Cornflower refers to the so-called rural calendar, in which each day of the year was named for a plant, animal, agricultural tool or mineral, to replace the old saints' days. In French, today is called Barbeau, which is cornflower in English, although some sites translate it as barbel, because this is also the French word for this fish, but animal names are only used for quintidis, the fifth day of the 10-day décade, and today is Primidi, the first day of the third décade. This seems to be according to Paris time, however, since it's about 8 hours ahead for me. Duodi 22 Prairial an CCXXI à 1 heure 84 minutes décimales t.m.P. Prairial by Laurent Rodier is a Windows 8/RT app that converts between the French Republican and Gregorian calendars. It displays the usual calendar girls for each month, and can display an entire month on one screen. It has live tile support, so it shows the date on your Windows Start screen. 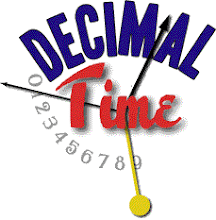 It also converts between standard and decimal times. It appears to display the current decimal time on a basic analog clock with 10 at the top. Since I don't have Windows 8 or RT, I have not tried it, but it's available for $1.49 in the Windows Market. It just happens that Prairial is the current month, the last month of spring. Duodi 22 Prairial an CCXXI à 1 heure 24 minutes décimales t.m.P.